In my Marketing Action Groups, a participant would often set a goal to perform a marketing activity such as writing an article or setting up a speaking engagement. And frequently they would get stuck or go off track. “Well, yeah, I guess I am. I’ll do it. I’ll bet my car that it will get done!” This was followed by loud cheers from the group on the call. And guess what? It always got done. Usually with a lot less effort than they had expected. The lesson is simple: When you make a promise with real consequences, something changes. Reality sets in. The mind’s homing mechanism goes into action. Since there’s no way they’re going to give away their car, they find a way to get it done. The thing is, you can’t keep betting your car. (What if you actually lost it?!) This is a useful wake up call. But it’s easy to slip back into the comfort zone of doing only what’s necessary to get by. Before you know it, you’re stuck and off track again. 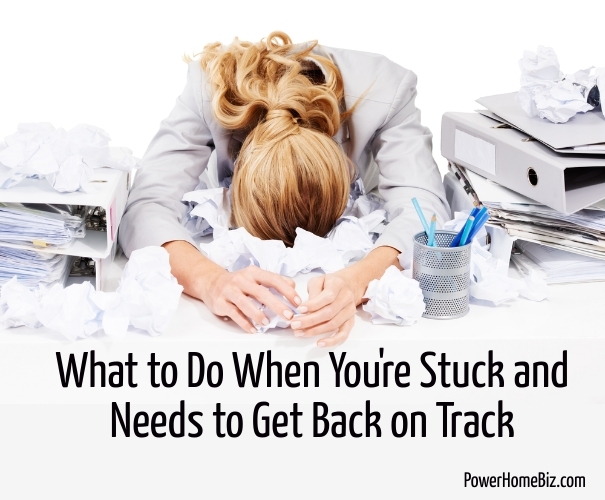 So how do you get unstuck and stay on track? There are some very practical and powerful ways to do this. Here are some that have worked for me and my program participants. This is just a variation on the theme of betting your car, except the bet is smaller and it’s for real. If you don’t take the action, you pay the consequence. One of my favorites is paying $25 to a political party you don’t like if you don’t take the action. Declare that you will be doing a particular marketing action by a definite date. Make it public to a group of your peers (such as in a mastermind group.) And ask them to hold you accountable. Don’t let each other off the hook. Be ruthlessly supportive. Intentions that get written down have a much higher chance of getting completed. Put the goal on your master projects list; create a detailed action plan; put specific action steps on your daily to-do list. Keep them on the list until done. If you want to do speaking engagements or teleclasses, book them first, then promote, then develop the program. Most do it in reverse, perfecting the program before committing to a date. This can lead to procrastination through perfectionism. Sometimes it’s not just a matter of doing it, it’s a question of how to do it. You may need input, brainstorming, guidance or consulting before you’re ready to commit to getting it done. But my recommendation is to commit first, then get support. Once you commit to something, your resistance just may kick in. And you’ll find a way to talk yourself out of it. Thoughts that say, “I can’t do it, I can’t find the time, and I’ll only be rejected anyway,” are worth close examination. Don’t believe everything you think! Be your commitments, not your thoughts. This may be the most effective of all. I’ve noticed that clients who have a burning desire to create a successful business don’t get easily stopped by challenging marketing activities. They just find a way. Think big and your enthusiasm will carry the day. 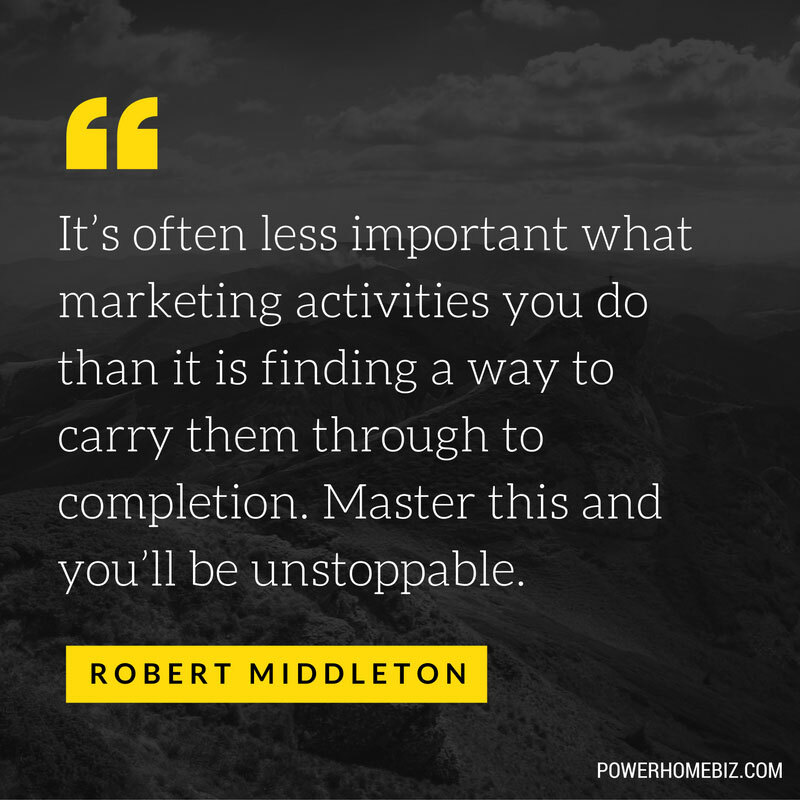 It’s often less important what marketing activities you do than it is finding a way to carry them through to completion. Master this and you’ll be unstoppable.